And another glorious sunrise, around 7.30 a.m. in the morning illuminating the paths of the overhead planes. It is Tuesday, so I am later with my good morning greeting as the cleaning lady is here and my routine is a little different. Whilst she is busy in the shower and bathroom, and sometimes kitchen (every two weeks) I clean the windows facing East or West alternatively weekly. They way I keep them nice and clean without too much work. Since I have my new routine of shopping in the afternoon I have now managed to fit it the cupboard doors and room door cleaning into my programme again. Now I really have everything under control. Why do I do this? Why not? It keeps me active in brain and body I suppose. Now that we have more daylight in the evening I also have a new job, and that is watering the garden. We have not had any rain for at least two weeks, although it is not completely dry. I noticed that various flowers are now appearing again. 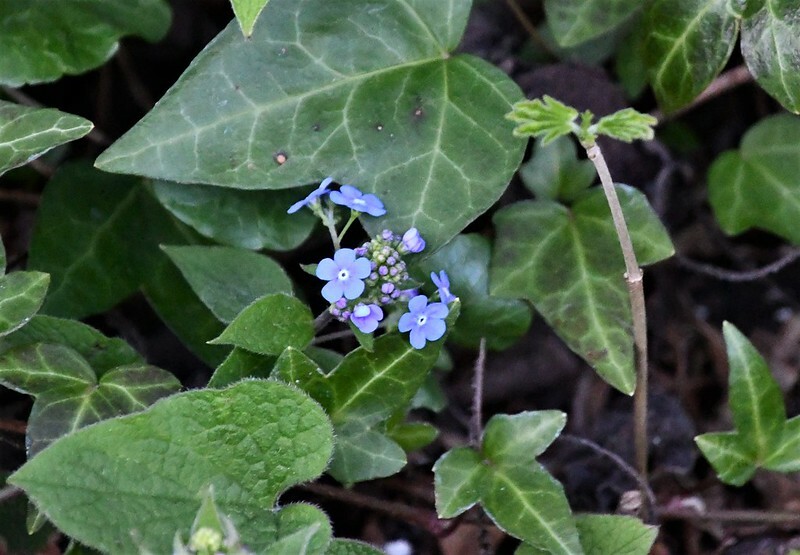 I have quite a lot of caucasian forget me knots in the garden. They are perennials and arrive every year with the blue flowers and leaves. They also tend to spread, but my gardener keeps them under control and they really make a nice blue splash of colour. Another annual visiter is this dandelion lookalike, but I realised it cannot be a dandelion as it has quite an interesting thick stalk. I had a look in my Plantsnap app and it told me it is a Hawkweed. It is probably an unwanted invader but it is not taking over up to now. Mr. Swiss was busy this morning sorting the tax documents for the guy that does the organising for us. From now on it will be my responsibility, so wish me luck. I just have to make sure I get all the documents I need. As long as I have a computer I hope to have it under control. I must say I am almost bilingual, but expressions of finance in German can be a little complicated, especially when tax related. And now to move on to finish cooking dinner, otherwise I more or less have everything under control. This afternoon I might go on an excursion to enjoy the weather and the scenery, but not into town. When the sun is shining I prefer to see nature developing and on Thursday we are supposed to be getting snow. 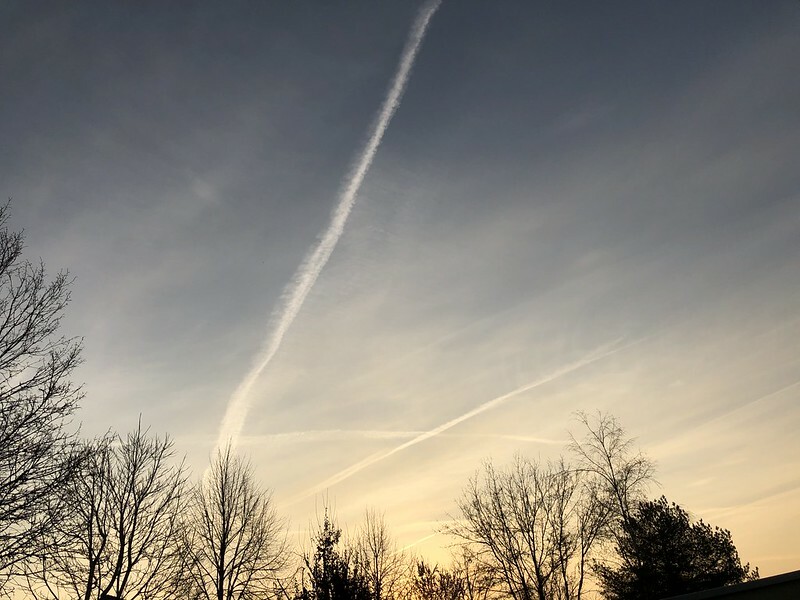 At first they said in the higher places, but now it seems everywhere, although I do not think it will lay around after the ground warming up this week. I wil let myself be surprised. Usually I do not go anywhere on Thursday, but I have to take Mr. Swiss to a dentist appointment. Have fun and make the most of the day. Just ignore those that want to spoil it for you. Perhaps my daffodils might cheer you up. That hawkweed is too mutilated to confirm the identity of. Besides, I am not very good at distinguishing between the various speciesof that group. Because dandelions are mere weeds here, and are not grown as a vegetable, we use the term very generically, for anything that resembles it. There are actually native species that resemble dandelion. We do the same with ‘red willow’. Although there really are species that are known as such, we refer to all four of the native riparian willows as such. Some are difficult to distinguish from each other. 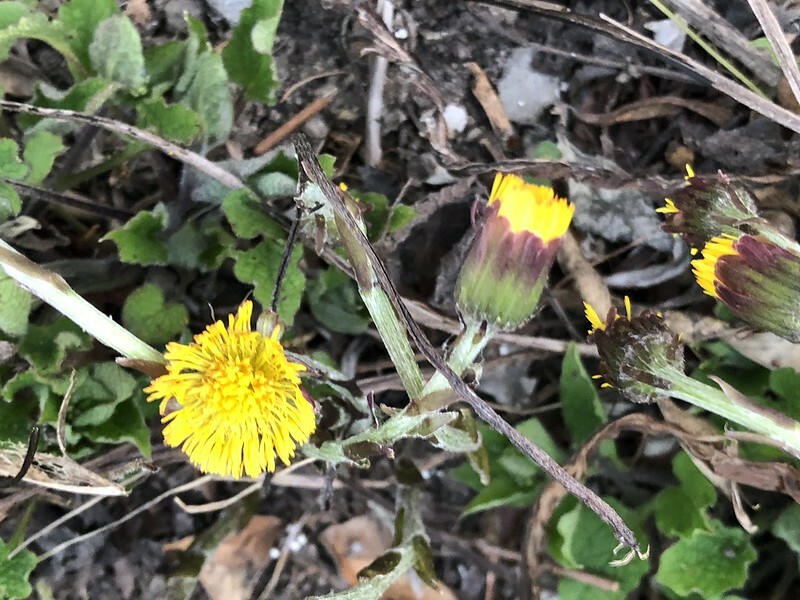 The hawkweed has quite a think stem with almost no leaves, it seems to grow in sections. Yes, I think it grows wild here too, but I never bothered to identify it. It is not as aggressive as dandelion is. I love your advice to ignore “those that want to spoil it for you.” I’ve been following that strategy a lot more lately. I hope your day remained as lovely as these photos. Up to now not too bad. Just got back from a wheelie and have moved inside as there is a breeze blowing with a cold edge to it. There are always those that know everything better unfortunately. I feel like those little buds pushing through…excited to start new again…happy spring! 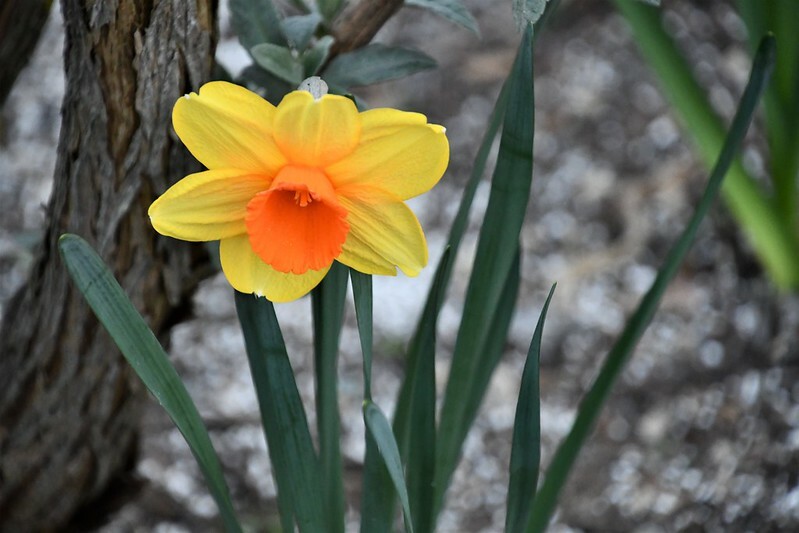 I’m excited because I can see the green of upcoming daffodils and tulips! Yay! The garden looks AWFUL. All the windstorms this winter have made it a twig-filled mess and our weather calls for 10 days of rain coming up. Ten day. Rain EVERY day. We are going to be mud city! 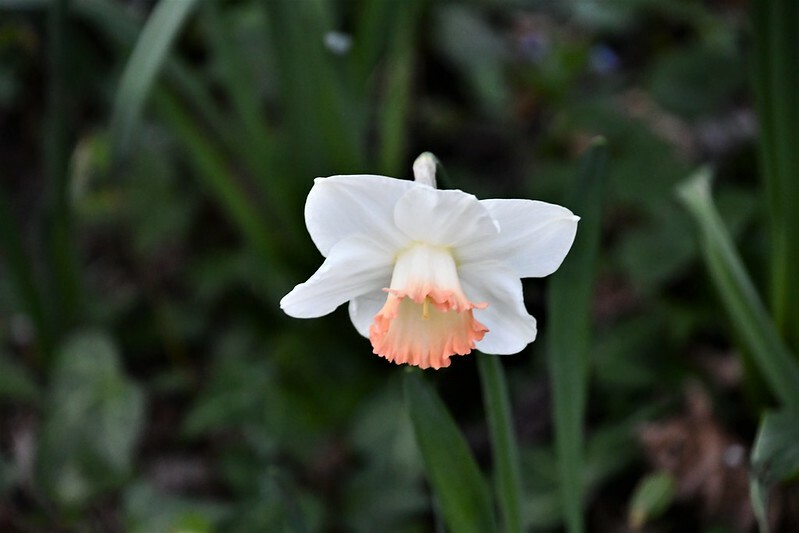 The white daffodil with the tinge of salmon pink is so different !! !